Then, you’ll need to visit your domain registrar, in this case Hover, and perform the following steps. Log into your Hover account. If you have more than one domain names listed in your account, click on the domain name that you want to use with customized DNS records. This will take you to its Domain Details page. Click on the Edit button in the Nameservers section. Log into your Hover account. If you have more than one domain name listed in your account, click on the domain name that you want to use with customized DNS records. This will take you to its Domain Details page. 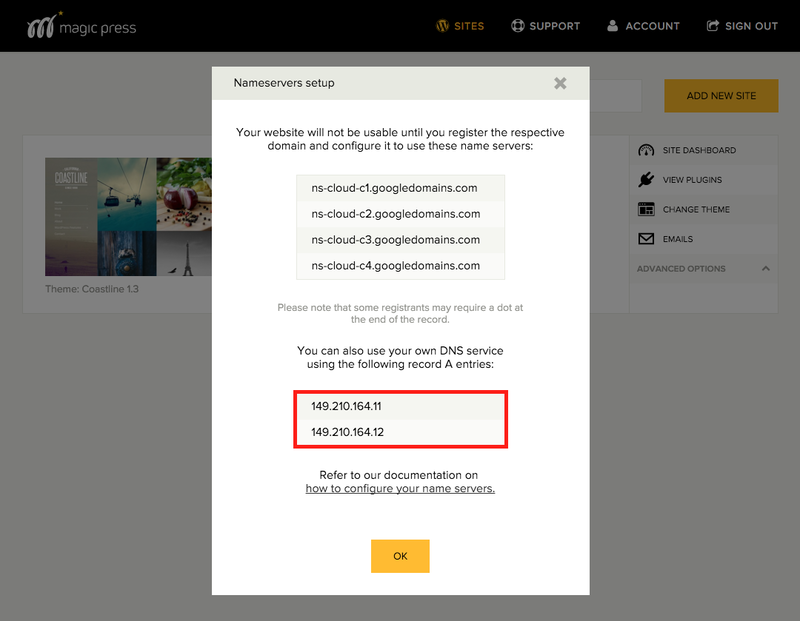 Click on the DNS tab to manage records for the selected domain name. Select the Record Type A. Enter @ as the hostname, which corresponds to your domain. In the Value field, insert the IP address provided in the MagicPress panel shown above. Click Save.